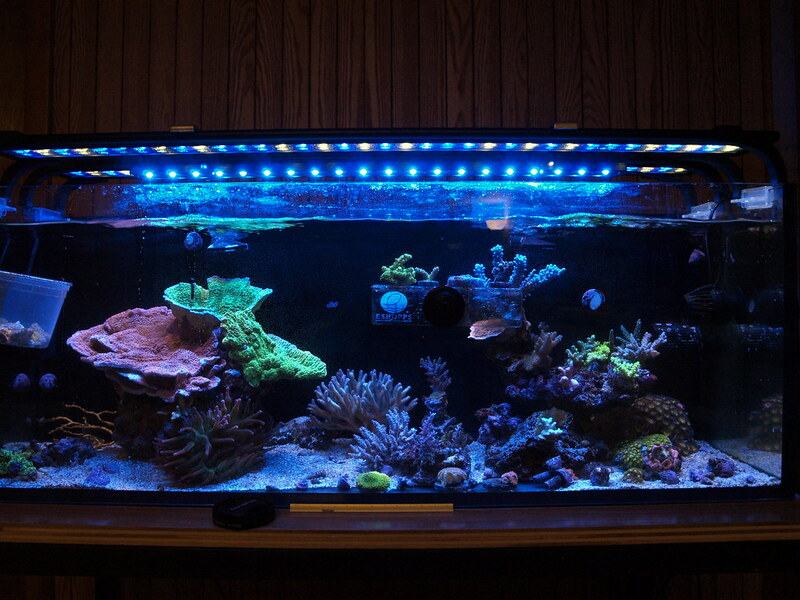 Light: NanoBoxReef Quad + 4 NBR Beams (all blue's), in a hybrid fixture. I think I got the NBR dialed in to the color I like, still gotta work on the Photo Mode and my camera skills. Almost FTS 3/4/2017 - The Monti is hitting a growth spurt! So is the blue tort in the center. FTS - 11/21/2016 excuse all the frag racks. FTS - 7/21/2016: Officially, the last FTS in Nuvo 16. After a long wait due to some shipping issues, the CADlights Mini 34 I ordered back during the Memorial Day wknd sale is scheduled to arrive today!!!! hope all goes well with this shipment. So the new tank arrived, leak tested and ready to fill. There's very limited space where I'd like the tank/stand to be. I'd like to essentially break down the current one and put the new one in its place. Is it ok to transfer everything into the new tank and add make up the additional volume with the new mixed saltwater? That'd be going from 16 gallons to 34 gallons; that's a bit more than double the existing volume (think similar to 50% water change) I'll probably grab some additional live rock from LFS to fill some of the added volume as well. 2. start the new tank and slowly move livestock over? And worry about the placement/location later. You can just transfer everything over at once. 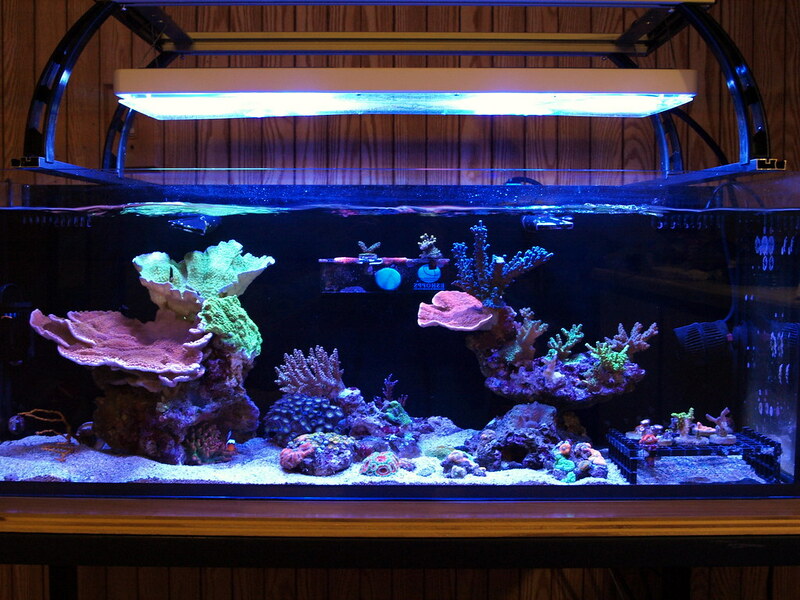 You will obviously have to make sure that the new salt water matches temp/salinity of the existing tank water. When my upgrade comes in I am putting the new tank in the exact same spot as the old tank. I plan to siphon the water into buckets with the livestock, and use all new water to fill the new tank (that has all matching parameters). No need to use old water since it doesn't carry any beneficial bacteria. You can even use all new sand if you want (if your tank even has sand). Thanks Elizabeth94! all new water in the new tank would certainly make the transfer a bit easier. Your Nuvo10 is filling in beautifully, so there's an upgrade in the planning? Any thoughts or recommendations from others out there? 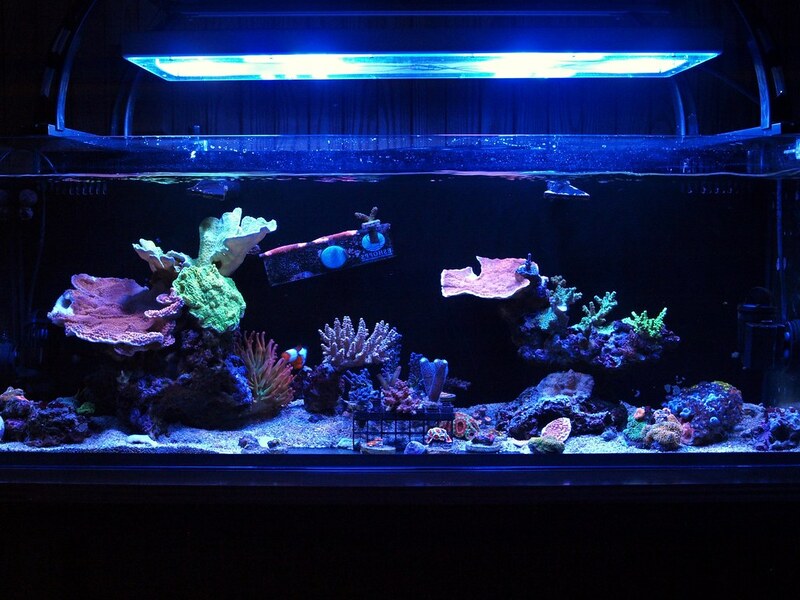 So came a cross the term "Bommie" quite a bit recently - there's a recent ReefBuilder piece on an awesome tank that they called Bommie, and then a bunch of posts on NR here. Google search shows bommies to be somewhat remote/isolated rock full of coral with pretty good open area surrounding it. What is a "bommie" in an aquascape perspective? How is it different from the "islands" style scape. I love the open sand bed look, so would like to learn a bit more if there's any difference between the two styles. What type of Acropora is this? Can anyone help me out? Very branchy, it's not like the pics of A.Valida I've seen, but the coloration is close, i guess . Decided on the moving strategy - gonna try to get some new pieces of cured live rock from LFS to add to the new tank and get that going for bit. It shouldn't take long to cycle. I want to carefully scape the new tank, so that I don't have to re-do it so many time (but who am I kidding?). Also, because I haven't decided on the scape, moving everything over right the way felt a bit unplanned. Planning is half the fun . A shot of both tanks side-by-side. I have no idea what it could possibly be. It looks a little browned out right now, I would give it some time to color up before we can ID it. The one I have looks pretty similar to yours, but its also browned out after the transfer. I am hoping my T5s can bump it back into shape. Have you put any rock in the new tank yet? I wish I put together a scape before I transferred like you are doing. Even something is better than no scape at all and plopping the corals and rocks in (like I did). 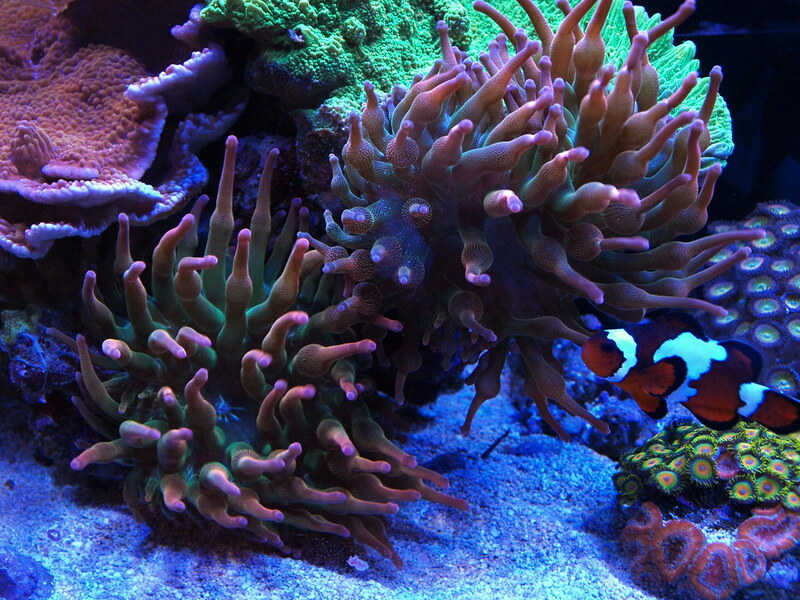 Since I keep messing around with the tank and rocks my corals are still pretty upset with me. Transferring stuff over is stressful, thats for sure. Thanks Liz, I always thought it had a nice color as it was. BUT you're right, I've found an article on ecotech website about their lighting program. (http://ecotechmarine.com/wp-content/uploads/2016/01/Ecotech_CoralLab_WP1.pdf) I definitely haven't been running the most optimal program for color. So I decided to run the light on a different program than before and the bluish purple is slowly coming in more and more. Just for reference, this was without the white balance adjustment). The photo was taken with a dSLR camera, so I think the "iPhone blue" effect was probably negligible. New Gorgonian (iPhone pic). After have been thinking about adding a gorgonian for a while. Decided to give it a shot, thanks to a very amazing photo from ninjamyst tank. Amazing!! I do not know too much about the different species of these guys. Is that one photosynthetic? that's same one I have! non-photosynthetic. feed your tank =P. multi branches and pretty big. nice pick up! oooh yeah! I just went back to look at your close-up photo , that's an AWESOME deal on yours too. Thanks for the tip on the non-photosynthetic part! I'm gonna have to feed the tank more regularly and often then (might up it to 3 times a week to see how the tank handle). Well, looks like I'm gonna need a bigger tank. So much for the open sand bed concept. Although I do plan on 'stacking' a few pieces to open up the sand a bit more and possibly re-locate a few corals. The red dragon gotta go somewhere more permanent. The rock it sits on is from LFS. I noticed that it doesn't like that much light, is that true? The new rock - the leather is sitting in one of the large crevices - is much bigger than expected. Good thing I didn't pick up the one twice that size from LFS. The gorgonian sheds slime/something daily, not sure if that's a good thing. I've been feeding the tank every other day since I got it. So I don't think food is the problem. Cultivated Reef order arrived this morning!!!! Now have to figure out where to fit all the frags into the minimalistic scape. Thank you for your feedback. I see you're a fellow Michigan nano-reefer! One more pic from this morning delivery. This was roughly 15 min or so after putting them in the tank. shaky pic, but you can see some polyps extending out already (except for the echinata, they're picky anyway). Yep - I actually think we have it pretty good with reef stuff here! Odd because of all the FW surrounding us LOL. Nice SPS haul - I want to get a green monti cap but I'm busy getting a Potter's angel to eat and also just started up a Fluval Spec iii that's going to be on my desk at work soon. Just checked out Cultivated Reef - some pretty sweet stuff there! This is the new female leopard wrasse, I semi-impulsively purchased. We named her Dot. That wrasse is great, glad it is doing well! While the leopard wrasse has been eating along with the others in the tank, it seems that she has been slowly losing weight. 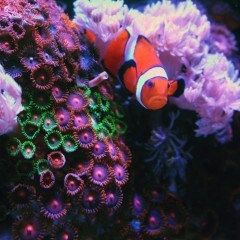 The clownfish, on the other hands, just kept getting bigger by the day. Yesterday, I found her laying very lethargic on top of the sand bed. At one point she was 'floating' upside down along the bottom , can't even right herself up. I don't know if this is due to weakness from weight loss, or an unfortunate run-in/aggressions from others in the tank. She's been burying herself uncomfortably close to the sand mound that the pistol shrimp piles up (might have a run-in with the pistol there). It's been about a day and a half now, while her condition doesn't seem to deteriorate, it's also not clear that she's recovering either. The past few times I thought I'm going to scoop her out and 'help end her struggle', she seems to be more alert though. She was able move around a bit better, and manage to bury herself under the sand. She still won't take any food even if i put it right in front of her. Not sure what to do at this point other than hoping for the best. Leopards are hard man.... Even if you are prepared, and have a good plan, there's a certain amount of luck with leopard wrasses. Many people have trouble getting their leopards to eat, which obviously makes things difficult. If you can get them to accept food, many wrasses come to us with internal parasites, which will kill them, even if they eat. Then add the whole hiding/sleeping under the sand aspect, and you feel pretty good if you have a 75% success rate with leopards. If she's eating but still losing weight, she's probably got parasites. You can try a 7 day PraziPro treatment to eliminate internal parasites. Keep feeding her, and hope for the best! Make sure she's got a nice sand bed to sleep in, and don't disturb her while she's buried. Also, Leopards are very active pod eaters. They graze constantly, and it really helps to have an active refugium linked to your system to provide a stream of live food for them to pick at. If you don't have that, they may accept the food you give, but still starve over time. Thanks for your insight. I was mainly relying on the LFS quarantine program (which is trustworthy enough, I tour their basement all the time checking out their QTs stock, extra frags, etc). From what I've read, most medication is either unsafe for inverts, or corals, or both. So I assume, I'll need to set up a separate hospital tank then? If she is truly infected/affected by the parasites, will her death causes the parasites to be released (through the scavenging crews) and then infect my other fish? If so, should I remove/move her to the hospital tank before that happens? All of my fish loss so far had been of accidental death, to see something 'in-progress' like this; it is hard to take. I could certainly investigate the QT/hospital tank idea later today. My only fear is that by the time I put the effort into it, it may end up costing me more than the fish itself and it's still a loss :-(.